The abilities of the characters tend to be subtle, although given the proper conditions can be very powerful. The more powerful an ability, the bigger the downside of that ability. For example, Brynne Vaness has the ability to see the future, which is actually a form of temporal telepathy and it can be directed to a certain extent, but it’s intermittent (she can only see pieces of the future), it can only occur when she’s asleep and she gets intense migraine headaches when she uses the power. She has a brain tumor that’s actually a telepathic and tachyon receptor that causes this ability. It will eventually kill her. All the powers must be based on physics or biology although these can be extreme versions of those. They have to be explainable through either extreme physics or extreme biology, so you may need to do your homework on related topics. If you are considering something in the science fiction realm, focus on Star Trek science fiction, rather than Star Wars pulp science fiction. Any ability that violates the rules of physics, like personal flight, power bolts, or bio-morphing (changing into an animal, a brick wall or some such thing). Any ability that violates the rules of biology, like being able to heal someone else’s physical wounds. Any magic, divine or supernatural-based powers. All the powers should be rooted in science and genetics. Mental abilities are the most common form of exceptional ability, particularly telepathy (see below). Things in the new-age, pseudo-science realm might work if they can be explained scientifically. Confusion between exceptional abilities that are mental or physical, but that may appear to be magical or divine will create interesting stories. All telepaths either have proximal (short-range) or distal (long-range) telepathy, not both. Proximal is alpha, beta, or gamma wave-based. Distal is delta wave-based and only occurs during sleep. Not telepathic – most of the population on Earth. However, if they are exposed to enough telepathic activity they may be able to sense when it’s occurring to them. Pre-telepathic – these are people who are sensitive to telepathic activity and may be able to sense it is happening around them or to them, but are unaware what it is. They may have more immunity to telepathic ability used on them. These are also people who tend to suffer from migraine headaches and may have some genetic telepathic trait that can be passed to their descendants. Lauren and Jeremy are examples. Latent or low level telepathy – these are people who are sensitive to telepathic activity, but may be unaware that they have it or exactly what it is. They are likely to experience rare or intermittent flashes of telepathic experiences, though they are usually unable to control this ability. There may be a genetic link and other family members may be telepathic as well. Dr. Morris believes there are about 250 people on Earth who fall into this category. Radha and Lex are examples. Medium level telepathy – these are people who know they have telepathy of some sort or another, and they are able to use the ability to varying degrees of proficiency. Dr. Morris believes there are less than 30 people on Earth in this category. Brynne, Ashley, Derek and Abe are examples. High level telepathy – these are people who know what their abilities are and are highly proficient at using their abilities. Dr. Morris believes there are less than 10 people on Earth in this category. Dr. Speerel, Gauthier and Maruyama Kura are examples. Other types of telepathy will be created as the series moves forward, including types of telepathy that require more than one person to activate and control. This is the first promotional image for the Exceptionals original series. Hello – Red Fox Vintage. Can I speak with the emergency contact for Angela Foster? Brynne, I’m calling from Legacy Emanuel Medical Center. There’s been a serious accident this morning. Ms. Foster was struck by a car. I’m very sorry to inform you that she passed away [as a result of the injuries she sustained]. Would you be able to come to the center to answer some questions for us? An eight year old girl is safe at home tonight with her parents after a day at the beach that almost turned to tragedy had it not been for the timely intervention of a heroic passerby. Near Cannon Beach earlier today, Jessica Lamont became separated from her parents as her family was playing on the beach. The girl was climbing along a rocky ledge overlooking the ocean when she lost her footing and fell into the turbulent water. As she grasped for the rocks and cried out, Brynne Vaness, who happened to be nearby, heard Jessica’s cries. As luck would have it, Vaness also happened to be carrying a rope with her and was able to reach the struggling girl within seconds. Vaness tossed the end of the rope to the girl and pulled her to the shore. It was her quick and selfless response that saved the girl’s life [pause] and returned Jessica to her relieved and grateful parents. Up next, be prepared for zombies … on bikes! It‘s the annual zombie bike ride through downtown Portland. disciplines, having just locked up gold in the women‘s flyweight Taekwondo event last week. Please join us for a free performance and the opportunity to be in our web series, Exceptionals, the chance to win some gift certificates to area restaurants, and an all-around unique experience! 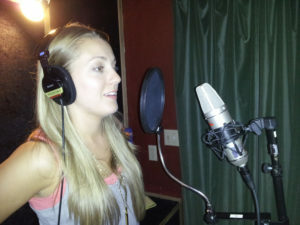 Nicole Chaffin recording “Do What You Must” for Exceptionals web series. We’re going to be filming this performance to appear in Episode 3 of Exceptionals and we need an audience. Audience members will be filmed and you will also get your name in the credits of the episode! Since we are filming this, please avoid wearing clothing with large and obvious logos, and also avoid stripes since that can cause funky distortions on film. No need to confirm your attendance — bring your friends and just come on in! Full Brain Films is excited to announce that Lori Lewis from FreeSpirit Casting will be the casting director of our new web series, Future Certain. Lori brings extensive knowledge and experience to FBF and this SAG-AFTRA project. We’ll be providing more information regarding the casting schedule and hiring timeline very soon.